SmartReo started in Australia with the support of Sidenor S.A, Europe’s foremost provider of automated prefabricated reinforced steel. Based in Wacol, in south-west Brisbane, our manufacturing plant is set to revolutionise the steel reinforcing market, introducing smart technology and innovation that will deliver superior value to clients. 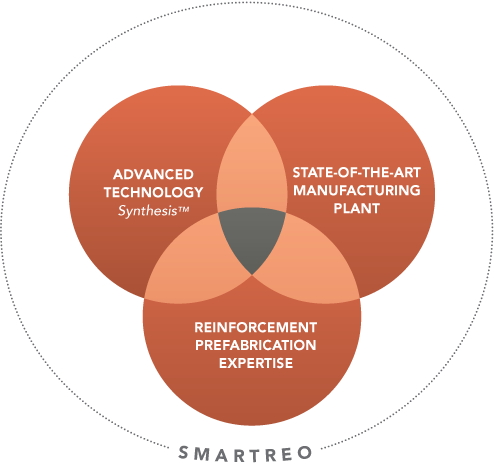 SmartReo has the exclusive licence in Australia and New Zealand for Synthesis, a new technology that automates the manufacture of prefabricated industrial reinforcing steel. Read more. Our technical and operations team use SmartReo-designed software to create virtually limitless industrial reinforcing solutions that meet our client’s needs and maximise production efficiency. Our experts possess unparalleled experience in reinforcement prefabrication with a unique knowledge of the Synthesis™ technology and its capabilities. Through this experience, they are able to leverage the prefabrication technology and equipment to improve upon and add value to traditional designs in steel reinforcing. The output is a steel reinforcing solution that is easier to place on site and reduces labour costs. In addition to Synthesis™, our manufacturing facility features the latest in industrial steel reinforcing equipment and technology in the country. All of our equipment has been modified to meet Australian standards and market needs.